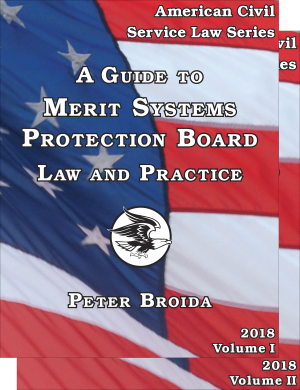 Written by Peter Broida, a longtime practitioner before the Merit Systems Protection Board, a lecturer on MSPB practice, and author of other various comprehensive titles on the law and procedure of the MSPB, the MSPB Guide is the standard reference on the MSPB and its reviewing court, the Federal Circuit. This treatise provides practice guidance and analyses of the relevant statutes, regulations, and case law. It is annually updated and extends back to the Board’s 1978 inception. With analysis of 2017 and early 2018 decisions of the MSPB and its reviewing court and major developments during 2017. This Guide is a component of the American Civil Service Law Series. Also included are a detailed table of contents, case table, bibliography, and index. A Guide to Merit Systems Protection Board Law and Practice is also available on a CD-ROM as a .pdf file with many useful features. Hyperlinks allow the reader to move quickly between the Table of Contents and Index entries and the corresponding portions of the text. Internal hyperlinks serve as a cross-reference feature within the text, and web links of major cases take users to full text versions available online.